Hi, my name is Judy Hudson. I was diagnosed with ovarian cysts about 3 years ago. It all began when I started having dull pains about two weeks before my period that I dismissed as menstrual cramps. After several months of experiencing mild cramping in my lower abdomen, as well as nausea, I was admitted to hospital to as the physician suspected appendicitis. I then saw a gynecologist who informed me she'd felt a medium sized cyst on my right ovary and several small follicular cysts on my left ovary. My doctor advised me to wait and come back in several months -- and hope for the best -- but the pain was getting worse as the days went by and I found myself taking pain killers daily. On top of that I couldn't sleep as fear and anxiety took hold of me. I still experienced a lingering, knife-like pain intermittently throughout the day. This went on for months. Some days the pain was so exhausting I couldn't even go to work. On my second visit to the doctor, my worst fears were realized: I found out that my cysts had actually grown larger. I now had a 6.8 cm cyst on my right ovary and the cysts on my left ovary had grown to 3-4 cm each. I didn't want to resort to surgery as I knew the tremendous risk involved and the chance of not being able to have children in the future, but the only alternative was to resort to various drugs and birth control pills. These simply did not work. The ovarian cyst on my right ovary continued to grow and the pain was unbearable. I can recall the times when I would curl up in a ball because the pain was so severe. I was at the end of my tether. In my quest for a cure I stumbled upon a website created by a nutritionist named Mary Parker. 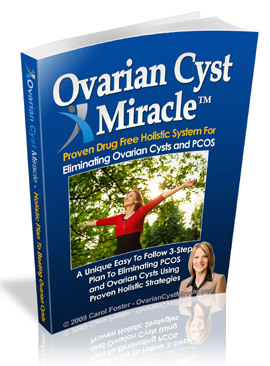 She claimed to have suffered from ovarian cysts for eleven years until she discovered a unique holistic solution for all types of ovarian cysts and PCOS. It appeared from the website that Mary was honest and knew what she was talking about. Anything was worth a shot at this point so I bought the book right away. It is important to note that before I bought Mary's program, I tried numerous diets, took herbal supplements, tried Chinese medicine, reflexology, homeopathy remedies, progesterone creams -- you name it -- but nothing worked! I can assure you that Mary's program is unlike anything you have ever seen. I followed Mary's instructions step by step. The results were almost instantaneous! After two days I felt a major relief and after about three weeks the pain was very slight for the first time in months and then finally it disappeared completely. Six weeks later I had an ultrasound test and my jaws dropped when I saw the results. All the cysts (both on my right and left ovary) had vanished. My doctor was practically speechless and so was I. It was the closest thing to a miracle that I have ever experienced. I am a totally different person today. I have lots of energy. I sleep through the night. I awake alert and full of life. I feel rejuvenated, energized, happier and so much healthier. I will forever be grateful to Mary Parker. I'm so excited about my recovery that I want to share it with the world. I created this website just for that purpose. Please write to me if you need encouragement and if you're looking for a cure, a REAL cure for your ovarian cysts, make sure you visit Mary Parker's website by clicking on the link below. Thank you again for visiting my website. Have a great day.